4ft zipped garment rail cover for clothes rails up to 4 feet wide. Centre full length quality zip for quick access. Large stylish zip puller. Made from premium grade 100gsm polypropylene - pink with white polka dot design. Excellent economical clothes storage. Great when used with our other hanging storage range. Brilliant for storing out of season clothes in spare room etc. Clear PVC large document pocket (22cm x 16cm). Suitable for long term storage allowing garments to breathe. 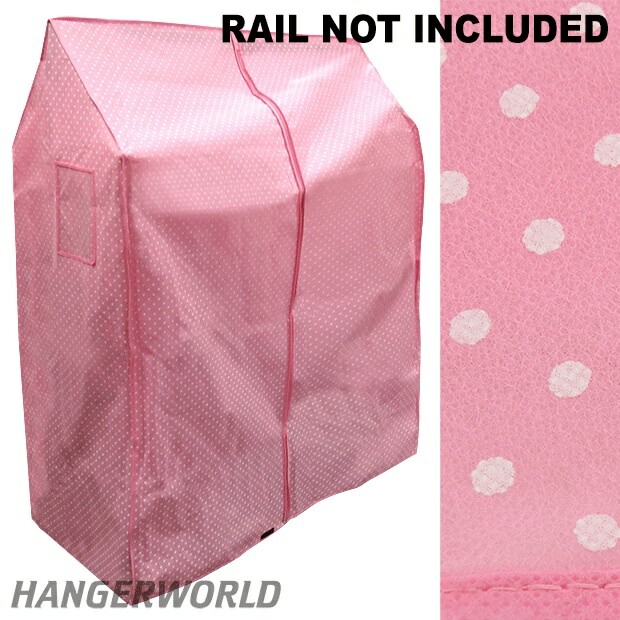 Protects hanging clothes from dust, moths, fluff, smells etc. Please note the rail is not included. Size: Width x Height x Depth: 119cm x 155cm x 57cm approx.